In addition to April 4 being the 50th anniversary of the murder of Martin Luther King Jr., it is also the fifth anniversary of the death of Roger Ebert, the admired film critic of the Sun-Times. If you are wondering why I'm remarking on one rather than another, it's that I looked back over what I've written over the years about King and was not impressed by anything in particular, considered what I might add to the already extensive conversation now, and decided my thoughts were too scattered to bear sorting out. On the other hand, this obituary, I believe, bears re-reading, because it reminds us that in addition to changing the way America watches film, Ebert also had an important role—perhaps an even more important role—in changing how we think of sickness and disability. It was the single most read story the Sun-Times posted in 2013, and while at first I thought "save it for 2023," my second thought was, "post it now; maybe you won't be writing this in 2023." Because these things do disappear. I have the Southtown Star to thank for having the obituary at all—I think this is an abbreviated version of what we ran, I'll have to dig out a physical copy and check. In the commotion after Roger's death, no one at the Sun-Times archived the obituary, but the Southtown ran this version and did. He lost part of his lower jaw in 2006, and with it the ability to speak or eat, a calamity that would have driven other men from the public eye. But Ebert refused to hide, instead forging what became a new chapter in his career, an extraordinary chronicle of his devastating illness that won him a new generation of admirers. On Tuesday, Ebert blogged that he had suffered a recurrence of cancer following a hip fracture suffered in December, and would be taking "a leave of presence." In the blog essay, marking his 46th anniversary of becoming the Sun-Times film critic, Ebert wrote "I am not going away. My intent is to continue to write selected reviews but to leave the rest to a talented team of writers hand-picked and greatly admired by me." Always technically savvy — he was an early investor in Google — Ebert let the Internet be his voice. Rogerebert.com had millions of fans, and he received a special achievement award as the 2010 "Person of the Year" from the Webby Awards, which noted that "his online journal has raised the bar for the level of poignancy, thoughtfulness and critique one can achieve on the Web." His Twitter feed has more than 840,000 followers. 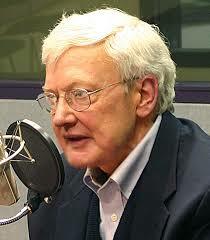 Ebert was widely popular and professionally respected. He not only won a Pulitzer Prize — the first film critic to do so — but his name was added to the Hollywood Walk of Fame in 2005. His reviews were syndicated in hundreds of newspapers worldwide. The same year Ebert won the Pulitzer, 1975, he also launched a new kind of television program: "Coming Soon to a Theater Near You" with Chicago Tribune movie critic Gene Siskel on WTTW-Ch. 11. The combination worked. The trim, balding Siskel balanced the bespectacled, portly Ebert. In 1978, the show, retitled "Sneak Previews," moved to PBS for national distribution, and the duo was on their way to becoming a fixture in American culture. In 1981, the program was renamed "At the Movies" and in 1986, it became "Siskel & Ebert & The Movies" where the duo began the signature "thumbs up, thumbs down" rating system that Ebert invented. After Siskel died in 1999, Ebert auditioned a number of temporary co-hosts and settled on Sun-Times colleague Richard Roeper in 2000. Ebert reviewed as many as 306 movies a year, and after he grew ill he scheduled cancer surgeries around the release of important pictures. He eagerly contributed to other sections of the papers — interviews with and obituaries of movie stars, even political columns on issues he cared strongly about. In 1997, dissatisfied with spending his critical powers "locked in the present," he began revisiting classic movies, and eventually published three books on "The Great Movies" (and two books on movies he hated). Ebert wrote more books than any TV personality since Steve Allen — 17 in all. In 2011 his autobiography, "Life Itself," won rave reviews. "This is the best thing Mr. Ebert has ever written," Janet Maslin wrote in The New York Times. It is being made into a movie, produced by his longtime friend, Martin Scorsese. Roger Joseph Ebert was born in Urbana on June 18, 1942. He began his professional writing career at 15, as a sportswriter covering the high school beat for the News-Gazette in Champaign-Urbana. Ebert graduated in 1964 from the University of Illinois, where he published a weekly journal of politics and opinion as a freshman and served as editor of the Daily Illini his senior year. He was accepted at the University of Chicago, where he planned to earn his doctorate in English. But Ebert had also written to Herman Kogan, for whom he freelanced at the Daily News, asking for a job, and ended up at the Sun-Times in September 1966. The following April, he was asked to become the newspaper's film critic when the previous critic, Eleanor Keen, retired. Ebert plunged into what turned out to be a mini-golden age of Chicago journalism. He found himself befriended by Mike Royko — with whom he wrote an unproduced screenplay. He drank with Royko, and with Nelson Algren and Studs Terkel. He wrote a trashy Hollywood movie, "Beyond the Valley of the Dolls." Eventually, Sun-Times editor James Hoge demanded that Ebert decide between making films and reviewing them. He chose newspapering, which increasingly became known because of his TV fame, which grew around his complex partnership with Siskel. In the early 1980s he briefly went out with the host of a modest local TV show called "AM Chicago." Taking her to the Hamburger Hamlet for dinner, Ebert suggested she syndicate her show, using his success with Siskel as an example of the kind of riches that awaited. While she didn't return his romantic interest, Oprah Winfrey did follow his business advice. In 1992 he married, for the first time, at age 50, attorney Chaz Hammel-Smith, who was the great romance of his life and his rock in sickness, instrumental in helping Ebert continue his workload as his health declined. In addition to TV and newspaper work, Ebert was a fixture at film festivals — Toronto, Cannes, Telluride — and even created a festival of his own, The Overlooked Film Festival, or just "EbertFest," which he began in Champaign in 1999 and dedicated to highlighting neglected classics. "Kindness covers all of my political beliefs," he wrote at the end of "Life Itself." "No need to spell them out. I believe that if, at the end, according to our abilities, we have done something to make others a little happier, and something to make ourselves a little happier, that is about the best we can do. To make others less happy is a crime. To make ourselves unhappy is where all crime starts. We must try to contribute joy to the world. That is true no matter what our problems, our health, our circumstances. We must try. I didn't always know this and am happy I lived long enough to find it out." Survivors, in addition to his wife, include a step-daughter and two step-grandchildren. A long time ago, I was a movie critic for about 15 minutes--enough to make me appreciate just how hard that job is (at least, if you care about doing it right). After that experience, I admired Roger Ebert even more than I did before. He had a combination of erudition, depth of knowledge and common sense that made his reviews not only valuable in the most basic practical way--do I want to see this movie or not?--but enjoyable in their own right, as pieces of writing. To me he was the best movie critic of all time. He far outshone the ineffably batty Pauline Kael, the unreadable Andrew Sarris and anyone else you care to mention. "To make others less happy is a crime"
What a wonderful man. At least he didn't have to live to see the person whose day consists of making others less happy take control of the ship of state. On the other hand, it's too bad we will never read what Roger's thoughts about Trump would have been. The man was laser-focused, and could sting like nobody's business. Some of Ebert's best writing had nothing to do with movies at all. It was mostly about the off-the-clock lives Chicago writers and newspaper folks led in their hangouts in the late Sixties and all through the Seventies...O'Rourke's, the Old Town Ale House, Riccardos, the Billy Goat, and the like. I was briefly on the fringes of that scene, but I have never been a hard drinker and I was more like a private who had somehow sneaked into the Officers' Club. Still, his writing about the drinking life made the reader feel like he was bending an elbow next to Royko and his pals. Then Ebert eventually woke up, wised up, and finally quit drinking. I will always be indebted to Ebert for an early review about an obscure 1967 British film called "The War Game" that successfully attempted to show the horrors of a nuclear attack. He began by saying that "they should string up bedsheets and show this film in every public park." It was pretty tough stuff to watch. I shakily walked out of the nearly-empty theater in my college town and took a left turn, and haven't looked back or apologized for doing so in the fifty years since. That was because of Mr. E--and I still thank him muchly for it. The Northbrook Public Library provides full text access to the Chicago Sun Times from 1986 to the present. All you need is your library card. Thanks. But if the story was never archived, it isn't in the database. I first came to Chicago in late 1989 and was excited to read the reviews of both Siskel and Ebert after having watched the show for years. I quickly learned that Siskel only wrote one capsule review a week for the Trib while Ebert reviewed every movie for the Sun-Times. What I remember with a mixture of bafflement and amusement after Ebert's death was the Trib going all-out in its coverage. Ebert certainly deserved it as a writer, human, and Chicago treasure, and many of the appreciations were wonderful and heartfelt and sincere, but it came across as if the Trib was trying to claim him as its own somehow. I know that wasn't the intent, but nevertheless it hit me that way. Tying this post to yesterday's, he gave 1973's "JCS" movie adaptation 3 stars. "Norman Jewison's 'Jesus Christ Superstar' is a bright and sometimes breathtaking retelling of the rock opera of the same name. It is, indeed, a triumph over that work; using most of the same words and music, it succeeds in being light instead of turgid, outward-looking instead of narcissistic. Jewison, a director of large talent, has taken a piece of commercial shlock and turned it into a Biblical movie with dignity." He liked London and wrote a little book about the best London walk: stopping at Keats House and a shop where Orwell worked; onto Hampstead Heath through the "Vale of Health; up Parliament Hill for the best overlook of the city; stopping for lunch and a pint or three at "The Spaniard"; viewing the picture gallery and Adam library at Kenwood House; ending up at Highwood Cemetery, the final resting place of many of England's great and notorious. If you're in London town and want a pleasant ramble try to get a copy. I know. I was invited to a birthday party of his and, not sure what to get a man who was a millionaire who had everything he wanted, ended up giving him a guide to London from the 1930s that I had found in a used book shop. He was appreciative. I already knew most of the territory when I came upon his little book because I had roomed with a family in Hampstead (their friends and next-door neighbors were the Freud's -- Anna then still extant) and spent many summer Sundays roaming the Heath. However it did inspire me to push on to Highwood Cemetery, where I asked a little lady at the gate collecting donations for upkeep of the property where I might find George Eliot's grave and she responded brightly "Oh yes, up there on the hillside. Just to the left of Karl Marx."